I have had a busy food blogging week attending & helping out Hannah, founder of Chicp (chicp.co.uk) at BBC Good Food Festive Fayre held in the spectacular and historic Hampton Court Palace, King Henry VIII’s former hunting lodge, on Richmond Upon Thames, Greater London. I also visited my favourite food market area – Maltby Street (Ropewalk) & Druid Street in Bermondsey as my foodie friend Meredith (foodatheart.co.uk) was showcasing her vegan chocolates for the first time at the market. I find these events inspiring as I get to meet some interesting people, finding about their food journey & tasting their craft foods. I will be writing about Chicp and some other artisans in 2017, so watch this space. Back to beer and food pairing with pick #2: Sour Dry Hop Ale (4.9% APV) by Anspach & Hobday (@AnspachHobday, anspachandhobday.com), who are based in Druid Street, Southwark, London SE1 2HH in a railway arch next to the market. Thanks again to Lee from @beerasylum for the beer pick which is refreshingly citrus and tart, typical of a sour ale that is becoming more popular in the USA & UK. 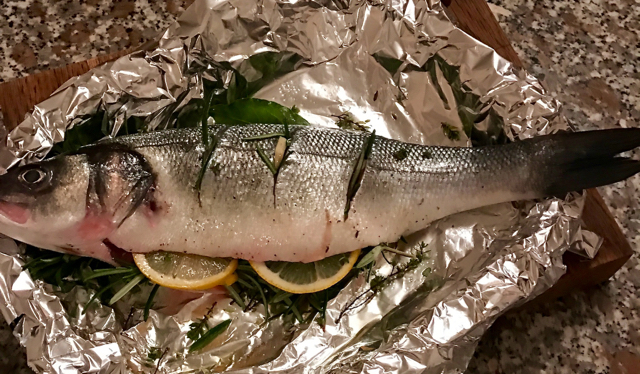 I decided to pair with Mediterranean roasted sea bass, which is easy to prepare & cook and makes a healthy meal. To serve squeeze a little lemon over the fish. You can eat as is or remove the skin or fish for those that don’t like to see the head & tail! I serve with a simple salad of fresh spinach, tomato cucumber & a few olives, dressed with olive oil & sherry vinegar. My Mediterranean roasted sea bass and Anspach & Hobday sour dry hop ale – a tasty, match!